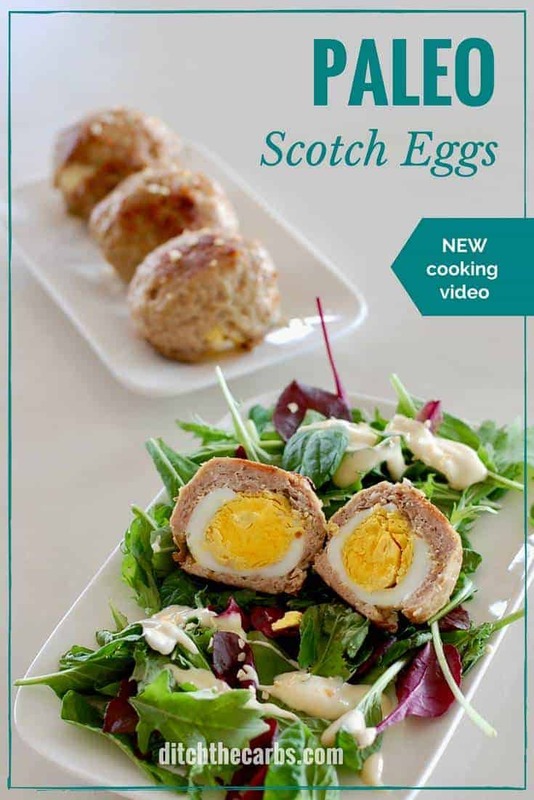 Keto Paleo Scotch Eggs - watch the quick cooking video. ZERO carbs. Keto paleo Scotch eggs just got easier, I made a quick cooking video (scroll down to watch) to show you just how easy these are to make. These are perfect for a complete meal served with salad and home made mayonnaise, perfect for a picnic and especially brilliant for a high protein snack. 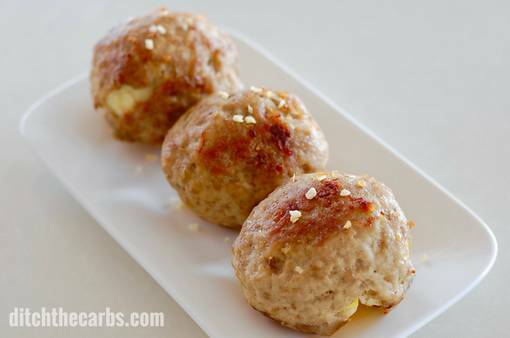 Keto paleo Scotch eggs are portable, sturdy, affordable and can be frozen. So why not make a double or triple batch and freeze the rest. I make my Paleo Scotch Eggs for school lunches, but we also eat them for breakfast and dinner. They are such a powerhouse of nutrition and are sturdy and portable. Traditional scotch eggs are usually rolled in breadcrumbs and use oats or flour as a filler and binder. You don’t need any of those. 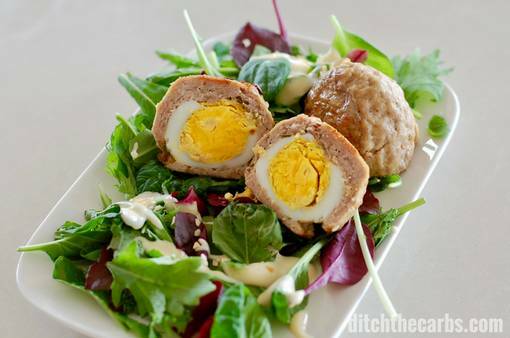 Keto paleo Scotch eggs are simply eggs, meat and a few herbs. What could be healthier? Wheat free, grain free, gluten free, sugar free and easy. Being high in protein and healthy fats, will keep you fuller for longer, and keep blood glucose and insulin requirements stable. Most recipes use sausage meat, which I don’t fancy as you never quite know what goes into THAT. I use mince/ground lamb, pork or beef. I also vary the herbs and spices to whatever we like. Add some curry powder, parsley or mustard. Keto paleo Scotch eggs provide almost every nutrient required, full of protein, good fats, Vitamins A, B2, B5, B12, E, zinc, folate, selenium, calcium, iron, potassium, manganese. If you are one of the few people left still worrying about their cholesterol, don’t. Read this post. Remember, inflammation is the real enemy. And what causes inflammation? You guessed it, a diet high in sugars, seed oils and processed food. 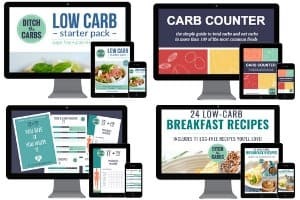 Watch the cooking video below, and remember my top tip for staying low carb. Always have a supply of boiled eggs on hand. 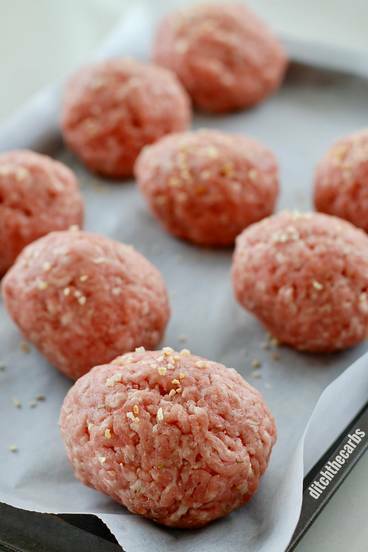 When you pick up some ground/mince from the supermarket, you can have these keto paleo Scotch eggs ready before the oven has even warmed up. I use the easiest method to boil eggs. Place your eggs in a saucepan and cover with COLD water. Bring to the boil and once boiling, boil for the following times, depending on firmness required. For keto paleo Scotch eggs, I boil the eggs for 4 minutes which is enough to set the egg whites and peel easily, but leaves the yolk slightly soft. The eggs are baked again in the oven once covered in the meat, so will cook further. Cover each boiled egg in ground/mince meat. Add flavours, herbs and spices to your liking. Sprinkle with onion flakes and bake until golden. Serve with a salad and homemade mayonnaise for a complete meal. Breakfast. Lunch. School lunches. Picnics. High protein snack. Paleo Scotch eggs are little powerhouses of protein. 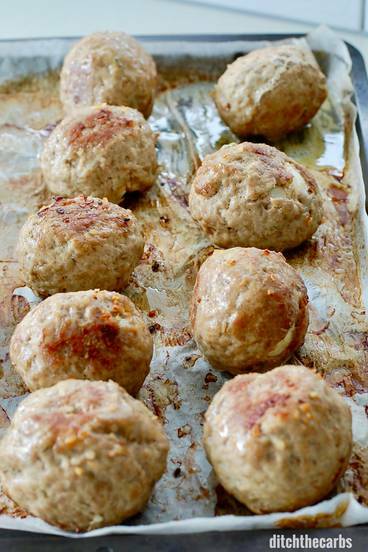 Who needs protein powders when you have Paleo Scotch eggs? Boil the eggs as instructed above. Mix the ground meat with the herbs, spices and salt. Flatten a small handful as shown in the video. Place a boiled egg on top and start to mold the meat around the eggs. Add more meat if required to ensure the boiled egg is completely covered. Press firmly to help the meat adhere to the egg. Place on a lined baking tray and brush Scotch egg with oil and sprinkle onion flakes (optional). Bake at 180C/350F for 15-20 minutes, or until golden on all sides. You may wish to turn the keto paleo Scotch eggs once whilst cooking to make sure they are golden all over. I use lean meat for keto paleo Scotch eggs. With less fat to render/melt while cooking, it makes sure the meat casing doesn't split during cooking. Nutrition is for the basic keto paleo Scotch eggs. Flavours and spices are in addition to this. For example add the following if used in the recipe or as a garnish. Do you freeze before baking or after? I bake them, allow to cool, then wrap in baking paper an pop in an airtight container in the freezer. Perfect for school and work lunches. Would these be good to freeze? I was just wondering how long you think these would last in the fridge? I would keep them for 3 days covered in the fridge. Thanks for another great recipe idea! It never gets boring around here! Love the video!